Protein, protein, protein! We hear about it so often, but what is this wonder substance and what foods should we eat to get enough of it? 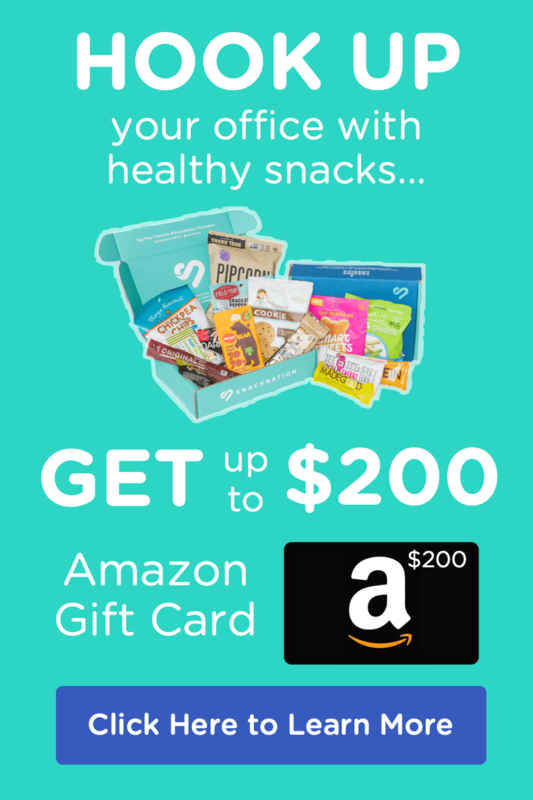 Keep reading to learn about healthy protein snacks and find out how to snack like a person who understands protein. A protein is a molecule made of amino acid chains. The chains attach to form different structures and therefore different proteins, including essential antibodies, enzymes, and hormones. Protein does more than just build muscle; it features in many of your body’s primary functions. 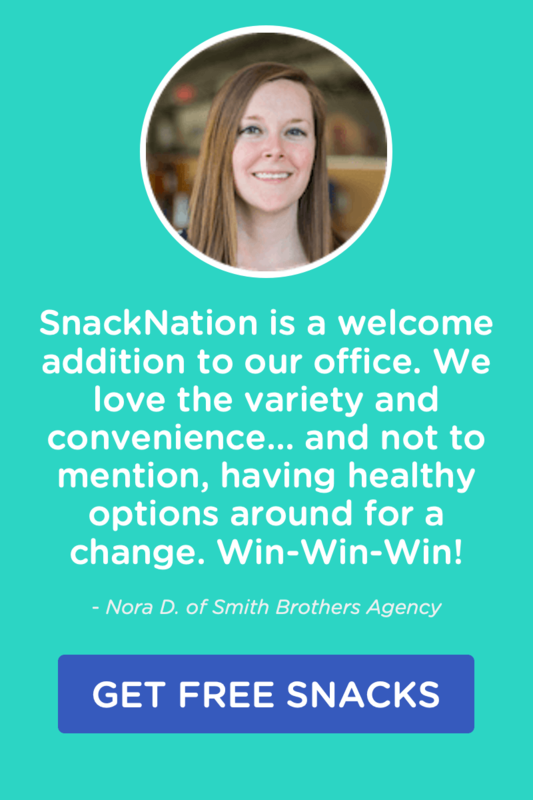 What does this have to do with snacking? As we mentioned above, proteins are made from amino acids. Your body can make some of its own amino acids, but it needs to get many of the essentials, what we officially call “essential amino acids,” by eating a variety of foods. When your body has all the necessary amino acids, it can make all the essential proteins. Making protein vs eating protein. Whether it’s from a plant or animal source, the protein you eat doesn’t immediately supply you with protein because it comes from a different organism, and it is designed for the particular needs of that organism. Your body breaks down the consumed protein into amino acid components and then does some restructuring to build protein you can use. This restructuring process is why you need to consume proteins, and therefore amino acids, from a variety of foods, healthy foods in particular. According to experts at the Harvard T.H. Chan School of Public Health, the “package,” or the health profile, of the protein-packed food you’re eating has a big impact on your overall health. 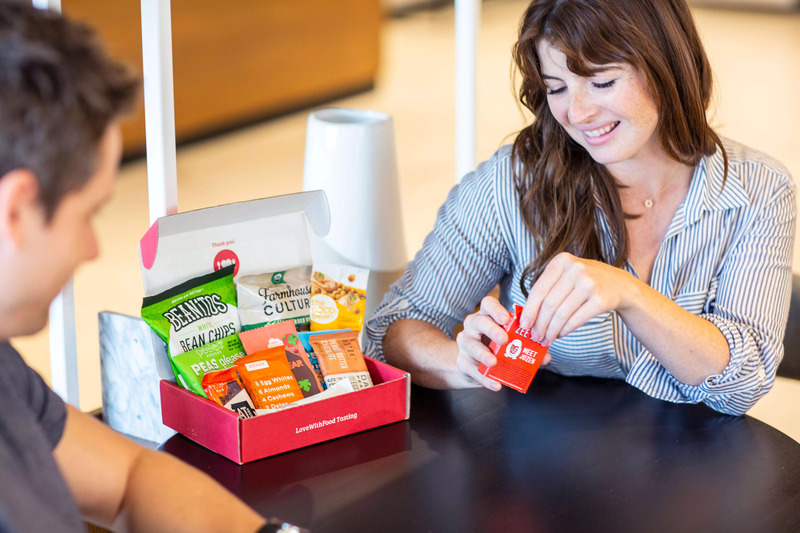 To be your best self, you should snack on a range of nutrient-rich, healthy protein snacks that are low in fat and calories. Below, we’ve broken down some of the basic foods that deliver the healthiest, leanest protein and amino acids packages. We’ve also listed snacks you can buy and make to get your fill of each protein source. Are you ready to get your protein on? Eggs—compact packages filled with lots of powerful nutrients. One large egg has 70 calories, 6 grams of protein, and a variety of other nutrients, including vitamin D, riboflavin, and selenium. Combine that nutrient profile with flavor and versatility, and you’ve got an ideal source of lean protein. 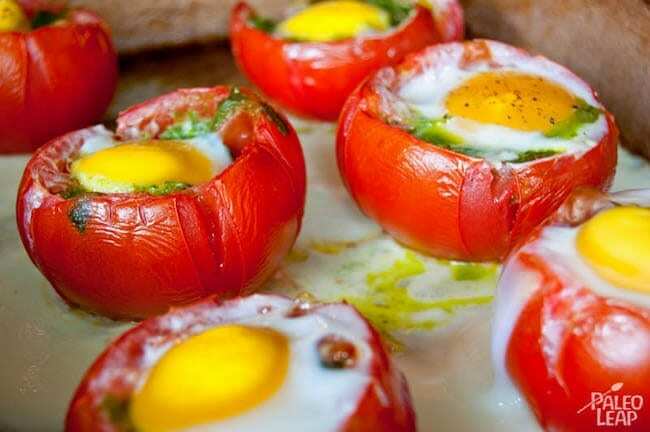 To make a high-protein snack, the cook behind Paleo Leap cracks an egg into a tomato and bakes it. Voila—you’ve got a nutrient-rich snack that won’t make you feel like a deprived, spartan bodybuilder. 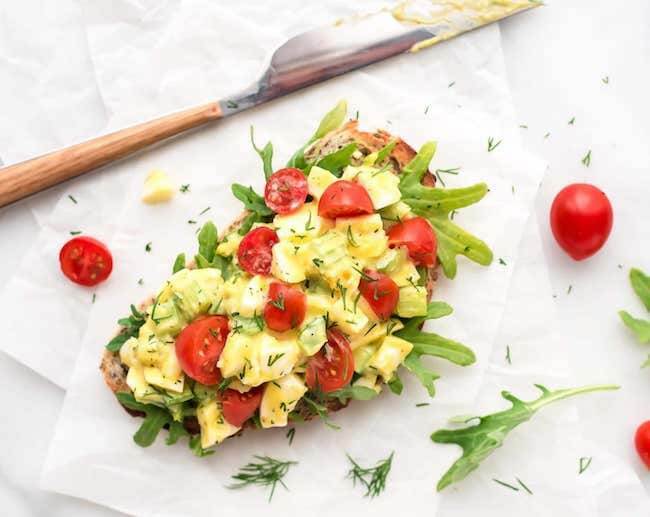 Make egg salad the Well Plated way, with nonfat Greek yogurt and mustard. This technique removes a lot of the fat and even adds in some extra protein. You can also ditch the bread and eat your egg salad on dainty cucumber slices. It might sound like a tea party snack, but it packs some serious protein. Who has time for a skillet? Luckily, you can eat wholesome high-protein eggs in three different ways thanks to the microwave. Poached: If you have an egg, a mug, and some water, you can enjoy a snack-fast poached egg. Get the instructions. Scrambled: Stir together eggs, milk, and salt…and then zap! Get the instructions. Quiche: Microwavable mug quiche is the savory snacking equivalent of mug cake. Get the instructions. With about 140 calories and 12 grams of protein per serving, yogurt* makes one tasty source of healthy protein, not to mention other good things, such as vitamin A, phosphorus, and calcium. Yogurt’s protein density and mild flavor make it an ideal base for a variety of healthy snacks. Skip the pre-flavored yogurt and make your own gourmet concoction with enough protein and flavor to keep you satisfied for hours. You can find pre-toasted sesame seeds in the Asian section of many grocery stores. 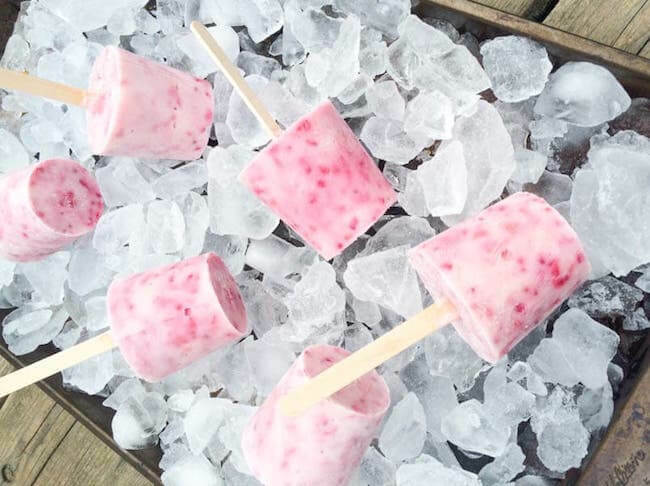 The cook behind the Lemon Bowl freezes some fruit and some yogurt in paper cups to make a high-protein snack that’s also a delightful frozen treat. Mix some robust Greek yogurt with hemp hearts and naturally low-sugar strawberries to create a powerhouse protein bowl that tastes more indulgent than it is. These nutrient-dense parfaits surpass every other sugary, frivolous, and empty parfait you’ve ever tried. Turn the “high-protein parfait” into a delicious new reality by layering Greek yogurt, apricot preserves, granola, and pistachios. If you’ve never thought about mixing peanut butter and yogurt, then you’ve been missing out on some scrumptious flavors and healthy protein. Eat this dip from Food, Fun & Life with any kind of fruit you want or straight off the spoon (we won’t judge). You can also skip the honey in this recipe if you want to cut sugar from your diet. This rose-water lassi (from the clean-eating experts at Whole Foods) makes high-protein eating fancy. Try it if you want to change up your protein smoothie routine. Many fish are remarkably high in protein and low in calories and fat. Take wild Atlantic salmon for example. One fillet (198 grams) has nearly 40 grams of protein and less than 300 calories. Fish is also full of monounsaturated and polyunsaturated fatty acids that are ideal for satiety. 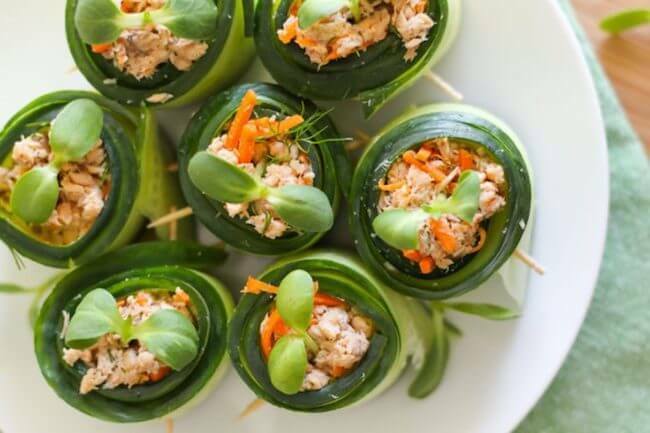 Make like the foodie behind Eat, Spin, Run, Repeat and roll up salmon and cucumber to make a snack that’s like a protein-packed sushi roll without the added carbohydrates of sticky rice. Classic tuna salad has lots of protein. Lighten up on the fat to make a snack that delivers a leaner, meaner protein package. This recipe from Tori Avey gets flavor and moisture from lemon juice and olive oil instead of mayonnaise. Eating fish on a stick has never been so delicious, healthy, or fun. 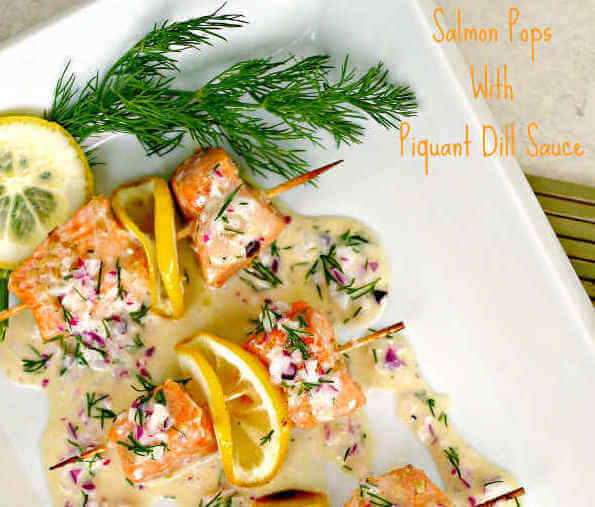 This snack from Only Gluten Free Recipes uses sesame seeds, lemon juice, and dill to bring out the flavors in naturally delicious salmon. Stir together some high-quality canned tuna, pineapple chunks, cubed avocado, and cilantro to make a healthy tropical tuna salad. Eat the mixture straight off the spoon or dollop it onto fresh cucumber slices. Nutrient-dense nuts and seeds have everything you need to stay full, including protein and good fats. Nuts and seeds are also incredibly versatile; they can be used in a wide range of sweet and savory protein snacks. The pure and simple almond makes a steadfast, go-to source of protein. 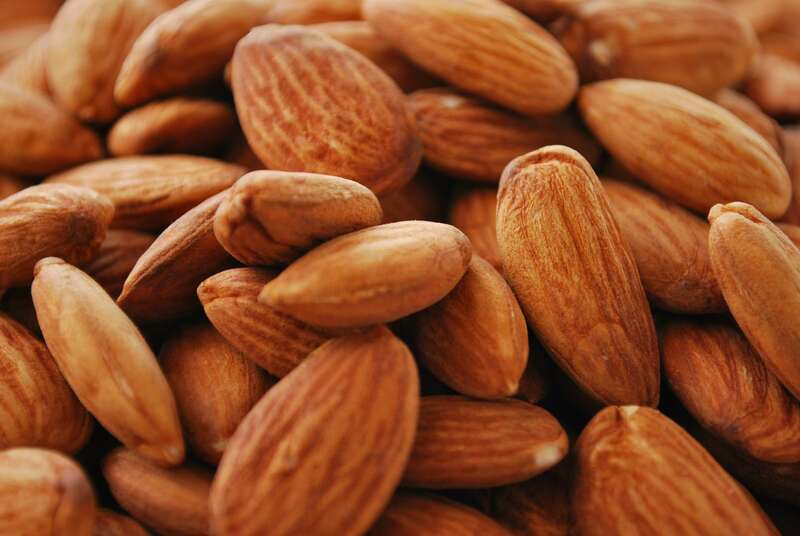 If you need fast and clean protein on the go, then almonds are your best friend. If you’re trying to prepare most of your own food, these no-bake bars, a quick alternative to their packaged counterparts, are an awesome choice. 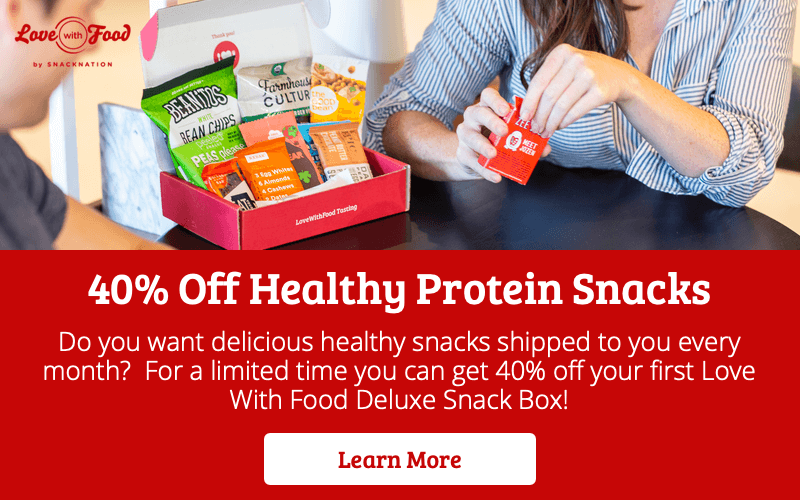 Oh She Glows uses vegan protein powder and almond butter to pack these tasty bars with plenty of protein. Protein balls are often faster and easier to make than protein bars, and these no-bake morsels from the Real Food Dietitians are no exception. 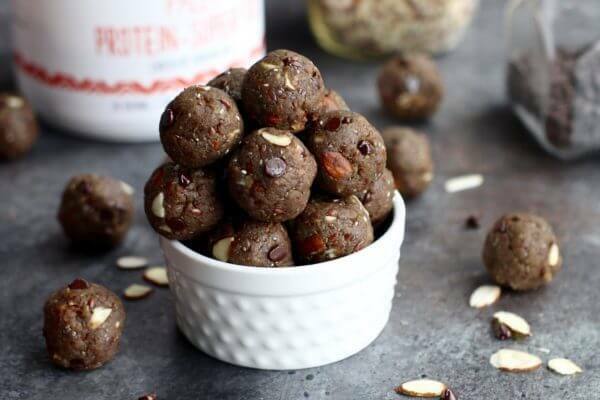 These bites are filled with protein from almonds, chia seeds, and clean protein powder. Who knew all those mucky seeds we scoop out of our jack o’lanterns were filled with protein? Well, they are—a 2-ounce helping contains 10 grams of protein. 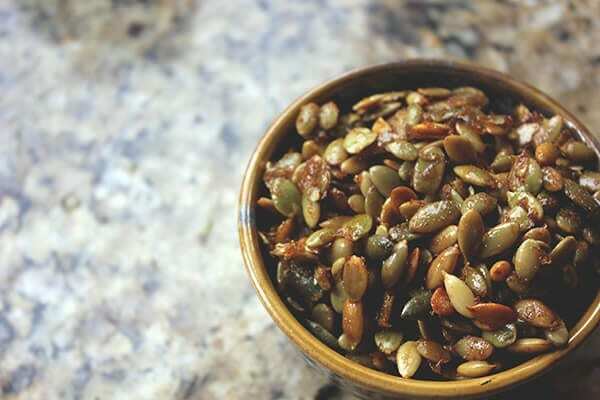 Find pre-roasted pumpkin seeds in your grocery store, or salt the raw seeds and roast them at 300 degrees for about 45 minutes. 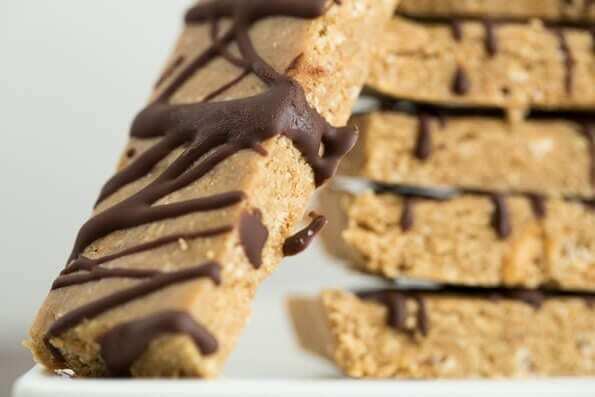 Versatile pumpkin seeds feature in these no-bake protein bars from A Big Man’s World. The bars are sweet, salty, and good for your body. Beans and legumes have been the choice protein of plant-based diets for years. These high-protein packages are mildly flavored, super low in fat and calories, and filled with protein, folate, and of course, fiber. In fact, beans and legumes contain a magical combination of protein and fiber that keeps you full and produces some healthy protein snacks. Lentil soup is great, but these crispy, portable lentils might change the way you snack forever. 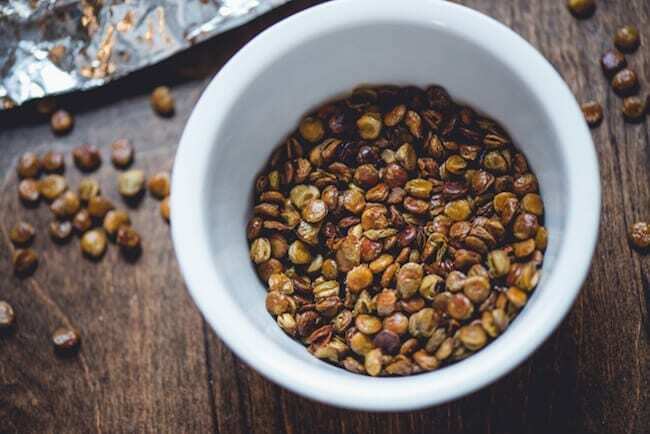 This recipe from Food, Fitness, Fresh Air makes it easy to enjoy the fiber and lean protein of lentils when you’re on the go. Blender soups are like savory smoothies. They’re fast, easy, and super healthy. They’re also perfect if you’re watching fruit sugars. Combine lime juice, tomato juice, cilantro, salt, and a pinch of hot sauce in a blender to make a protein-filled soup that tastes amazing hot or cold. Made with garbanzos and soybeans, this snack medley offers an anytime protein boost. Snack on the mix alone or add it to your salads, soups, and buddha bowls—anything that could benefit from extra protein. Combine garbanzo beans and a few other tasty ingredients in a food processor, roll the meal into balls, and voila—you’ve got Rawmazing’s protein-rich falafel that’s quick to make and awesomely tasty, no frying required. chocolate chips, protein powder, and other nutrients fill these WOLO WanderBars with a healthy dose of protein that goes down as easy as any tasty treat. 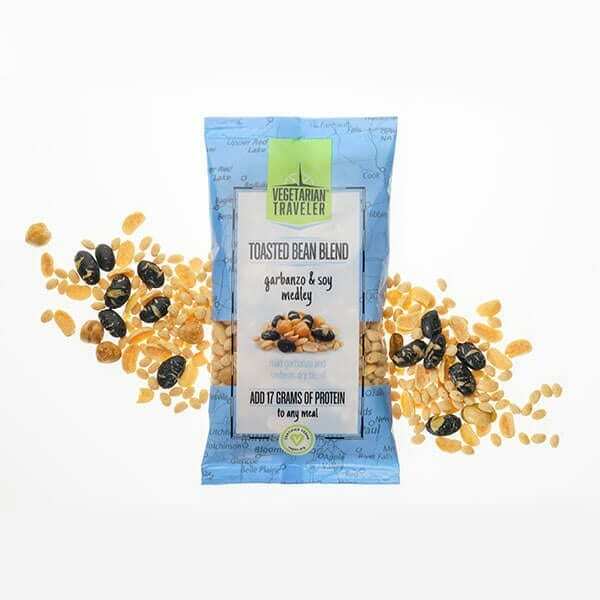 Pea protein goes into each of these golden-triangle chips. Eat a whole bag to get 15 grams of protein while downing only 120 calories. You can enjoy the protein-packed goodness of Protes chips in lots of tasty flavors, including spicy chili lime, toasted coconut, and salted caramel. 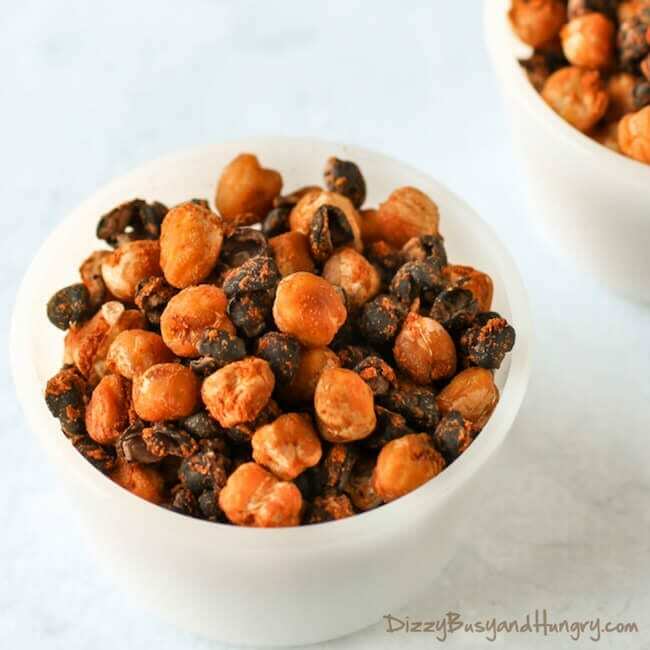 Simply season and bake chickpeas and black beans to make a crunchy snack that tastes like it came right out of a package. This recipe from Dizzy, Busy, and Hungry make it easy with only five minutes of preparation time. Healthy, high-protein whey is a by-product of cheese making. Basically, cheese is made, and the left-behind whey is processed further to remove stuff that isn’t protein. The result is a concentrated protein powerhouse that has plenty of amino acids and integrates easily into nearly any food imaginable. Eat chips and get your protein. Who says life isn’t fair? Delicious Ips Protein Chips are made from wholesome corn flour and whey protein concentrate. The result is a puffy chip with half the fat and twice the flavor of regular fried potato chips. 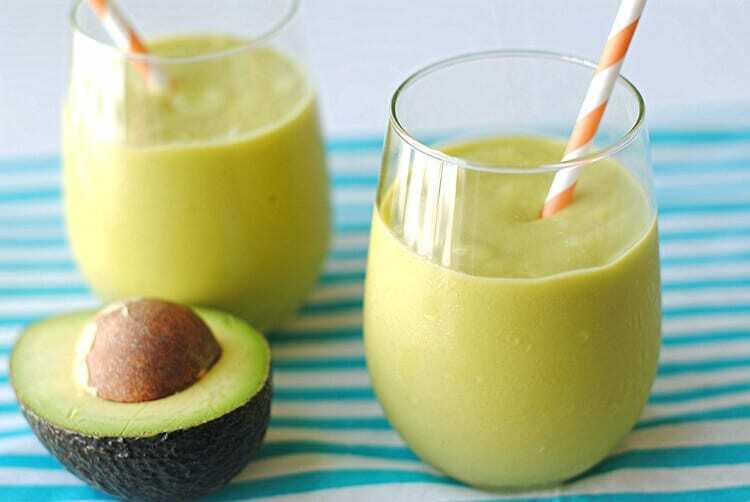 Blend one avocado, a scoop of whey protein powder, almond milk, and strawberries together to make a creamy smoothie that will keep you full for hours. Add a scoop of fig butter and your favorite whey protein powder to some plain yogurt to create a high-protein snack with rich and satisfying flavor. This snack is lighter than a smoothie, but it’s just as satisfying. Simply blend one ripe banana with a scoop of whey protein powder and about 3 cups of your favorite milk. The result has a creamier texture than normal milk and a lightly sweet banana flavor your inner child will love. A lean protein source, turkey* has about 125 calories, 2 grams of fat, and 26 grams of protein. It makes a perfect, satisfying base for tons of good-for-you protein snacks. These savory, paleo-friendly bars have all the herby citrusy flavors of a home-roasted turkey. 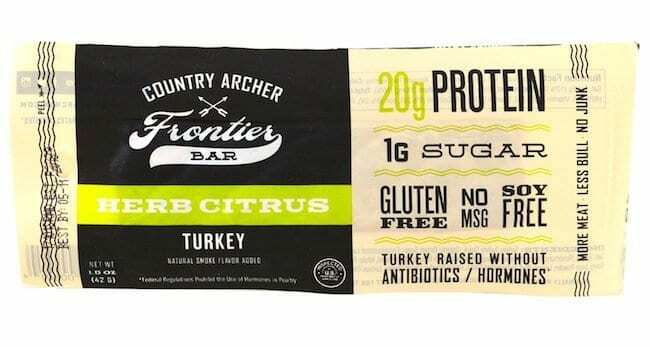 Made with clean turkey raised without antibiotics or hormones, each Country Archer bar contains only 1 gram of sugar. Who knew you could make your own clean healthy turkey jerky by skewering some turkey slices to the top rack of your oven? Well you can, and you should. Just follow this recipe from Mark’s Daily Apple. Grab a nitrate-free, low-sodium slice of packaged turkey breast and wrap it around a tart slice of Granny Smith apple to make a protein-rich snack with a refreshing flavor. And just so you know, you can make this snack with pretty much anything you want: pickles, carrots, mango, hot peppers, and more. Consider it your go-to reverse sandwich. Reconnect with the kid-style fun of creating cracker sandwiches. Use quality ingredients to make your nostalgic snack super healthy. Grab whole-grain seeded crackers, protein-packed sliced turkey, and light sliced cheese. Use a pizza cutter to slice the cheese and turkey into quarters and start making your sandwiches. Get creative with condiments to add even more adult flare to these healthy snacks. Get your turkey fix in snack bar form with the Epic Turkey Almond Cranberry Bar. This bar has all the satisfying flavor of a harvest feast, but it also gets down to business with 11 grams of protein. 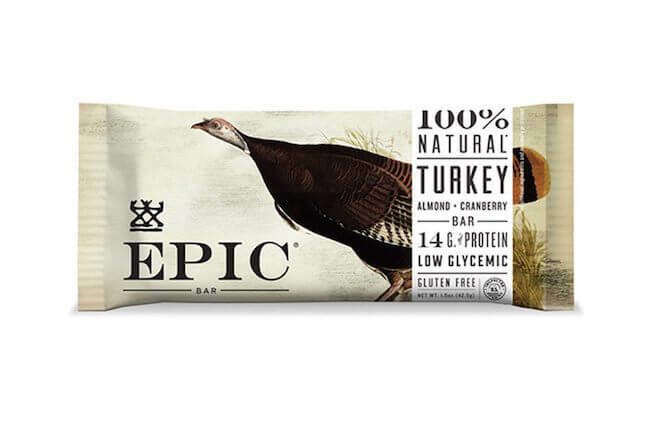 Epic puts only the best turkey into their bars—that means turkey raised without growth stimulants. What’s your favorite healthy protein snack? Let us know in the comment section below! Turkey & fish are the best proteins!!! When I eat them I am full and content. Read this again and in the mood for Salmon now. Yummmy!!! I love eggs in an omelet, but my favorite ones are the Benedictine eggs. Wow! Lots of fun ideas. Some fun ideas I hadn’t thought of were blending peanut butter with yogurt and I love all the ideas for fixing eggs! Very concise post!! We know that protein is one of the most important nutrients that is required by the body, especially when you are trying to lose weight.